Archive by Category "Asphalt Paving"
As a blacktop paving company in MD, we are often asked if asphalt and blacktop are the same. Although people use the terms interchangeably, there is a difference between the two. The materials that are used to make blacktop and asphalt are the same. Both are made from two ingredients: bitumen and crushed stone. The difference lies in how those ingredients are combined to make the final product. How are Blacktop and Asphalt Different? Asphalt is mixed in a drum to hold the temperature of 250 degrees minimum. At this temperature, the asphalt is malleable enough to pour onto roadways. Additionally, the high temperature ensures the asphalt will come out strong enough to handle cars driving over it. Blacktop consists of a different ratio of bitumen and crushed stone. For blacktop, there is a higher percentage of natural crushed stone added to the mix. The crushed stone gives a blacktop road the sparkle on the surface. Blacktop is also heated at a higher temperature, usually 300 degrees or higher. As a result, a blacktop surface can last quite a long time. Blacktop and asphalt surfaces are easily resealed after harsh seasons, giving them a newer look. 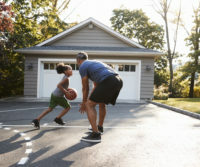 Playgrounds, pathways, parking lots, driveways and residential roads that don’t see heavy traffic are many places where blacktop is a good choice. 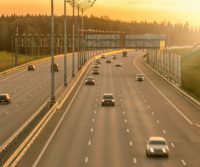 However, highways and major roads are typically made of asphalt. If you need a blacktop paving company in MD, A&M Asphalt Paving can do the job. Fully insured, we offer over three decades of experience. When paving a new driveway, we ensure that a professional contractor will be able to complete the job efficiently and properly. 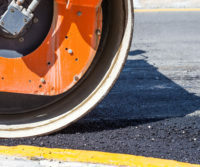 We provide a wide range of services including blacktop paving, new asphalt construction, asphalt re-surfacing, complete driveway rip-outs, asphalt patching, and seal coating services. Plus, we offer stone and grading services for stoned gravel driveways, tar and chip driveways, and grading and topsoil. Contact us today for a FREE estimate. 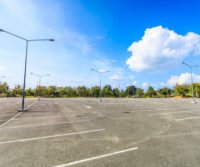 With the winter weather coming to an end and spring around the corner, you have probably noticed that your business’s parking lot has several rough, damaged areas. If so, now is the time to address these issues and patch up the holes and cracks in your commercial lot. 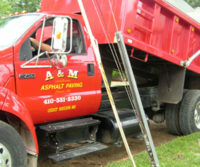 If you are looking at asphalt paving contractors in Baltimore, A&M Paving should be your first call. Winter wreaks havoc on asphalt. Even if the pavement does not have any holes or large cracks in them before the wintry weather starts, moisture from rain, snow and ice finds its way into the tiny cracks that you cannot see. 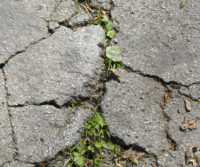 When moisture builds up inside of the cracks and freezes, the expansion places pressure on the pavement that can lead to cracking and crumbling. Add to this type of damage the rough scraping of from snow plows and you will see potholes start to form in your parking lot. Until the freezing weather conditions pass, it is futile to try to make any repairs, as the thawing and refreezing will only cause more damage. However, once the threat of winter is over, you need to contact experienced asphalt paving contractors in Baltimore to see about patching up the damage. When trying to find a contractor to fix your business’s parking lot, you want to make sure you choose the right company with ample experience in dealing with winter damaged asphalt for the job. Doing so will ensure that the damage is repaired correctly the first time without the need for repeat repairs. At A&M Asphalt Paving we have 30 years’ experience repairing cracks and pot holes created by adverse winter weather conditions. We will come out to your commercial property and carefully inspect the damage. 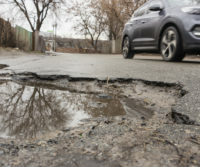 Not only will we discuss your various options for repairing the cracks and filling the pot holes, but we will also give you a free estimate, so you know how much the job will cost your business before we even start working. Contact A&M Asphalt Paving today to find out more about our company and services. Discover how we can repair the damage winter weather caused to your parking lot. What Causes Cracks in Asphalt Driveways? The worst thing that you can see in your driveway is cracks. Cracks develop slowly over time. Plus, each new one damages the integrity of your driveway. Eventually, if you ignore them you will have weeds sprouting through the cracks and the entire surface will not be smooth or level. For a new, crack-free driveway, A&M Paving provides professional repair and asphalt paving in Millersville MD and the entire Baltimore area. What Causes Cracks in Asphalt? Unfortunately, eventually most asphalt cracks. Even the most well-maintained driveway in a temperate location is likely to develop cracks. Cracks are usually caused by one of two things: tree roots or shifts in the ground below. It is hard to prevent either of these things from occurring. However, a properly installed driveway usually experiences less cracking. Here lies the difference between choosing a handyman vs. a professional paving company to install a driveway. The good news is, if you act quickly your driveway cracks will not turn into craters. Once you start to see cracks appearing you need to call in a professional to repair and seal your driveway. This will smooth out the cracks, preventing new ones from popping up where the driveway may now be compromised. It is extremely important that you choose a professional company to install or repair your asphalt driveway. They inspect your current driveway and assess if there are any other issues that may be compromising the integrity of your asphalt. If you are looking for asphalt paving in Millersville MD, then look no further than A&M Paving. With over 30 years of experience, our licensed crew offers sealcoating, asphalt re-surfacing, driveway installation and replacement, and asphalt patching. Additionally, we can work with tar and chip and stoned gravel driveways. Contact us for a free estimate. Dips in a driveway can be a great nuisance to homeowners. Therefore, they require repair in a timely manner. Large dips can even damage vehicles, so it is best to fix them to protect your car, as well as the look of your property. If you have questions about your driveway or need asphalt paving in Odenton MD, or the surrounding area, please read on. What Causes a Driveway to Dip? A dip in your driveway can be caused by a number of factors. Most commonly, an underground collapse below your driveway weakens the base. Secondly, the base layer suffers when water seeps below the surface. Dips develop in the weakened areas. Additionally, changes in soil volume through expansion and contraction causes the ground to weaken subsequently causing dips to form in your driveway. Soil erosion due to improper rainwater drainage can also cause your driveway to dip. Your driveway needs excellent drainage to prevent dips. Building a driveway on unstable marshland can cause damage in the base layer of your driveway. Consequently, dips form. Another issue is sinkholes. They occur in places where sand covers the bedrock. Water seeps through the rocks and causes dips. Erosion agents, especially water, cause displacement of soil resulting in dips in your driveway. It is cost-effective by preventing further deterioration of your driveway. Repairing it quickly will help you save money down the road. A driveway with dips looks really bad and it signifies neglect. You need to maintain its appearance so that it can appeal not only to you but also to people who visit. Keeping your driveway in top shape extends its life. Be sure to seal your driveway after repairing the dips to prevent water seepage, as well as further damage. For high-quality asphalt paving in Odenton, MD, contact A&M Asphalt Paving. Our services include new asphalt construction, asphalt resurfacing, complete driveway replacements, asphalt patching, and stoned and grading services such as stoned gravel driveways, tar and chip driveways and grading and topsoil. When choosing a material for your business’ driveway or parking lot, you need something that is cost-effective. However, you also want good long-term value. Asphalt is one of the best options for paved surfaces for your business. The smooth, even surface makes a good impression on your customers. Safety. 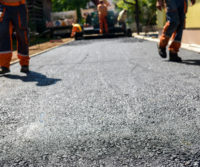 Asphalt can be modified to prevent skidding and promote proper water drainage. Increased property value. Improving the look of your business’ exterior significantly increases the value of your property. Easy to maintain. Unlike other paving materials, it is fairly easy to touch-up asphalt every once in a while to keep it looking good. Keep up with regular seal coating, pothole repair, and promptly fill any cracks. Additionally, you will want to sweep away leaves and debris to keep it looking clean. Affordable. Asphalt is not only faster to install and easier to maintain, but it typically costs less compared to concrete pavements. Durability. If installed correctly and properly maintained, asphalt paving will last for decades to come. A well-built driveway can be used for many years before it needs major reconstruction. Recyclable. When worn out, old asphalt pavement can be excavated, crushed, and mixed with fresh asphalt for future paving projects. This reduces its environmental impact. A&M Paving builds and maintains asphalt paving in Columbia MD and the surrounding areas. We focus on improving your property’s value by installing, repairing, cleaning up, and maintaining your asphalt surfaces. Incorrect installation results in the pooling of water which erodes the substrates and creates air pockets. Therefore, it is very important that you get the installation done right the first time. We back each of our projects with 30 years of asphalt paving experience. We use the right equipment and employ a highly qualified staff. Contact us today for a free, no obligation quote. Your asphalt driveway or parking lot is an important aspect of your home. With years of exposure and use, it starts to wear down, develop holes, cracks, and other surface defects. In order to preserve your driveway and to avoid excessive asphalt driveway repairs, routine maintenance and occasional repairs are required. It’s always a good idea to watch out for signs of wear to fix them right away before they become significant problems. Here are signs your asphalt driveway needs repair. Alligator cracks – Cracks develop due to various reasons. It’s important to respond as soon as possible as possible especially before winter so that the freeze-thaw cycle doesn’t expand them. Buckling and warping – Warped or buckled asphalt can occur due to heavy vehicle use or an insufficient base. Often, an asphalt driveway repair expert can level the area or when not possible replace both the asphalt and base. 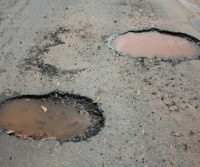 Potholes – If cracks are ignored for too long, potholes will eventually develop. They collect water and lead to further deterioration of your driveway. Drainage issues – If you notice puddles/standing water in your driveway, your drainage system may not be working properly, and may need repair to help redirect the flow of water. Why is it important to repair your asphalt driveway? Repairing your asphalt driveway will keep it looking great and add to your curb appeal. More importantly, making any repairs as soon as you see them will extend the lifespan of the driveway and save you thousands of dollars that would otherwise need to be spent on a replacement. 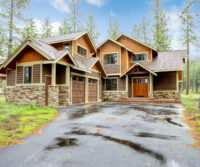 Driveway repair is, therefore, a great way to boost curb appeal without investing a lot of money. There are many reasons why A&M Paving is considered to be one of the leading asphalt driveway repair contractors in Annapolis, MD. We offer professional, high-quality and reliable asphalt pavement services, and always strive for excellence on every job. Our experienced asphalt specialists use the latest and highest-end materials and equipment available to complete each job right and deliver superior results. If you or your business needs asphalt paving, specifically asphalt paving in Annapolis MD, contact us today to have the necessary repairs completed for a long-lasting and functional driveway. We are ready to help with your residential and commercial asphalt driveway and parking lot repair.